Stepparents who adopt their stepchildren are special. Like other family adoptions, adoptions by stepparents are done with the best interests of the children held high. As it should be. When all parties agree, the process for stepparent adoptions in Florida is fairly simple. Sometimes the biological parent is not available to consent to the adoption. Other times the identity of the biological parent is not known. In either of these cases, the process is slightly more complex, but not at all impossible for a pro se litigant. Part of the stepparent adoption process is to terminate the parental rights of the biological parent. Termination of parental rights is never to be taken lightly. The biological parent being asked to terminate parental rights should search their heart, and seek legal advice if at all unsure about what to do. If all parties agree, it is simply a matter of completing the proper forms properly. Then those forms are filed with the clerk of court. At the time of the initial filing the joint petition for adoption is filed along with the Consent and Waiver by Parent. After the paperwork is entered into the clerk of court's system, then the couple seeking the adoption can request a court hearing. If a biological parent's whereabouts is unknown, the party seeking adoption must conduct a search for the parent gone missing. 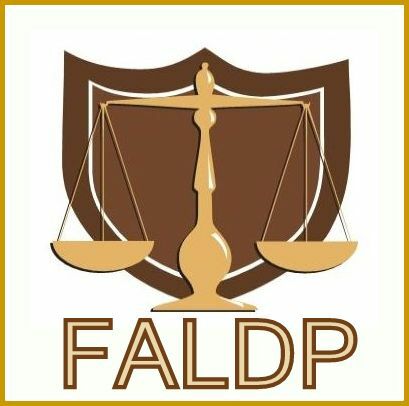 The Affidavit of Diligent Search is a list of places where they must search for the biological parent. The list includes things like: Prisons; Cable Companies; Utility Companies; Hospitals; Military; an Internet Search; and the U.S. Post Office. Florida Statute Chapter 63 addresses adoptions by family members. To be considered a family member for the purposes of a family adoption at least one of the adoptive parents must be within three steps of consanguinity - blood relation. For example, if a couple is adopting the wife's sister's daughter - their niece - then the aunt is within three steps of blood relation, but the uncle is related by affinity (marriage). Grandparents, great grandparents, and siblings are also within the three steps of blood relation. Single close relatives are also allowed to adopt. Florida publishes forms for stepparent adoption, but not for the other types of family adoption. The procedures are similar, but not identical. In a stepparent adoption, only the consent from one biological parent is required. In the other types of family adoptions consents from both parents are generally required. Within three steps of blood relation - consanguinity. A search of the putative father registry is required in all adoptions. Originally the registry was created to protect the rights of an unwed father if his identity was unknown, which then means that his whereabouts is also unknown. The adoptive parents must request a search of the putative father registry. The putative father registry is maintained by the Department of Health and Vital Statistics. The purpose is to protect the rights of unwed fathers, and it serves that purpose to an extent. For example, if an unwed couple has a child together and then separates the father can register as the putative father to preserve his paternal rights. More commonly the registry protects the father's rights when the couple separates while the mother is pregnant, and the couple loses contact with each other. But, the rules are that the search is required in all Florida adoptions, whether the father's identity is known or not. Adults who live and work in the state, are of good character, and have the ability to nurture and provide for a child may adopt. Single adults, as well as married couples, may adopt. A stepparent may adopt his or her spouse’s children. The requirement for a Home Study, criminal background check, and taking the Model Approach to Partnerships in Parenting (MAPP) course are waived for stepparent and close family adoptions. In stepparent and close relative adoptions, the adopting parent(s) typically finalize the adoption and terminate the biological parent(s) parental rights at the same time. The biological parent's obligation to pay ongoing child support ends when the adoption is final; however child support arrears are a vested interest of the child, and are still owed. Ten days after the judge signs the Final Order of Adoption, the clerks of court seal the file. Adoptive parents need to request several certified copies of that court order within that ten day window. Each entity that the parents must notify of the child's adoption will require a certified copy of that order for their files. The number of certified copies the parents should request varies depending on the age of the child. The older the child, the more court orders they'll need to have. Entities such as the social security office; the child's physician; the child's school; the Department of Health and Vital Statistics; the child's day care provider; and extra-curricular activity and sports centers; may all require a certified copy of the final order of adoption. These entities do not just need to see the order, they need it for their files. And it may not be a copy, but must be a copy certified by the clerk of court. For all legal purposes, the adopted child will be considered the natural child of the adoptive family. Further, the adopted child will be legally considered as if he/she were born into the adopted family. That child will be deemed equal with all other children that may then be or later come into the adopted family. This means that the adopted child will inherit equally to those children biologically born into the family for purposes of estates and wills or divorce. It is as though the child was born into the adoptive family initially. Guide, procedure and forms for adoptions in Florida by Grandparents, Stepparent, and close family relatives. 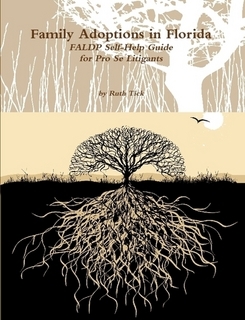 FALDP Self Help Guide series. Includes updated content, new forms, all available Florida Supreme Court forms, adoption scenarios, adoption checklist, and step by step instructions.